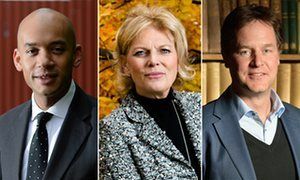 Soubry & Umunna to launch £1million campaign to keep us in the EU! Details are still sketchy but remainiacs Soubry and Umunna are to launch a new campaign to try and stop Brexit. It has been funded with £1million pounds and is called 'The Peoples Vote'. They are pushing for a second referendum in order to stop brexit. It will be launched at a rally in London this week and is set to have cross party support from figures such as Nick Clegg & Tony Blair. Click here to join our campaign to fightback! Read: "Nicola Sturgeon bans 'British Values' in Politically Correct madness!" Read: "BREAKING NEWS- The UK is going to WAR!"